Welcome to Our Crafty Mom! It’s my favorite time-Fab Furniture Flippin’ time! I have been having so much fun experimenting with Saltwash-our June sponsor. The theme for this month is Coastal Inspirations and that is right up my alley! Disclosure: I received free product from Saltwash in exchange for writing a review on the blog. Although this post is sponsored all opinions are 100% mine. I only promote product I believe in! As with any piece, I first gave it a good cleaning and then repaired one side that needed to be reattached, but other than a few scratches, it was in great shape. I am using the headboard in my daughter’s room, which has soft muted tones of greens and grays. Here are the colors I went with. Doesn’t the Saltwash packaging just make you smile? 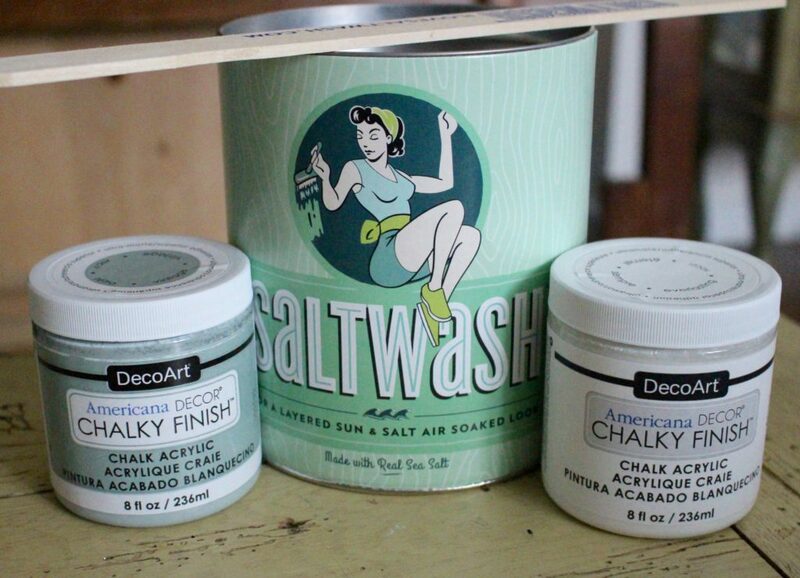 You can use Saltwash with any paint and it is colorless, so it retains the paint color! The application process is very simple, but I admit I was a little nervous to use it at first because I have never used a paint additive before. Let me say my fears disappeared quickly and the fun began even quicker! You add 20-25 oz of Saltwash with the included scoop to one quart of paint. That means I have a whole lot of Saltwash left for other pieces, yay! You only use Saltwash in the base coat, basically applying thick layers of frosting like texture. Please refer to the video on Saltwash for a full tutorial. I gave the entire headboard a nice thick basecoat in white and let it dry. I knew this was going to be so cool. You can just see the texture! After about 15 minutes I went back and lightly brushed the entire piece with my brush to reduce some of the peaks. 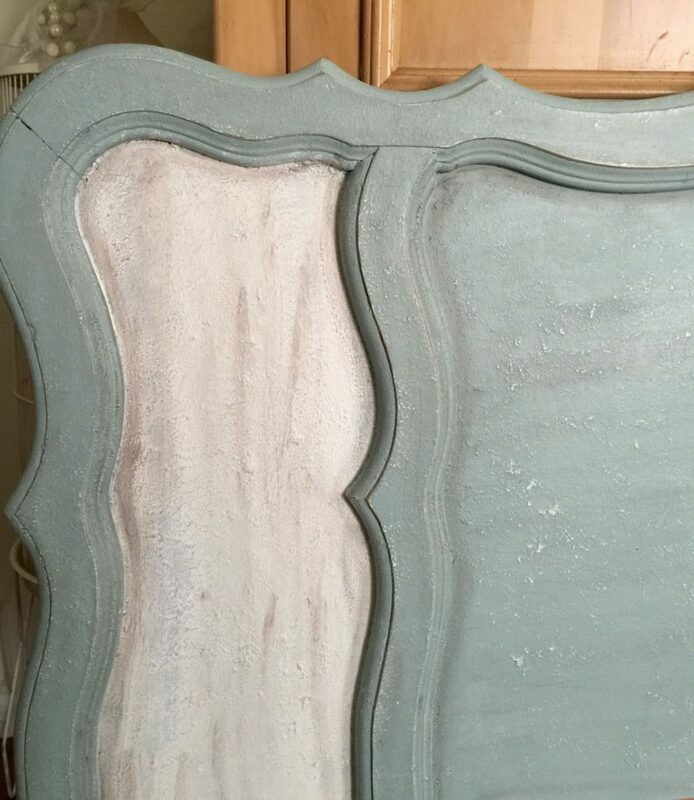 Next I gave it a coat of the main aqua color and added white chalk paint to the outer panels. Nothing says “Coastal Inspiration” more to me than a Seahorse! Luckily, my daughter loves Seahorses and I just happened to have a Seahorse stencil! However, I really wanted to make it look as if the Seahorse was engraved in the wood. I felt with the age and style of the headboard it would be more fitting. This was not an easy process, but I am thrilled with the results! I used plaster filler thickly applied to the stencil letting it dry overnight. I used a very liberal amount giving it an almost fossil like appearance the next day-it was very cool. 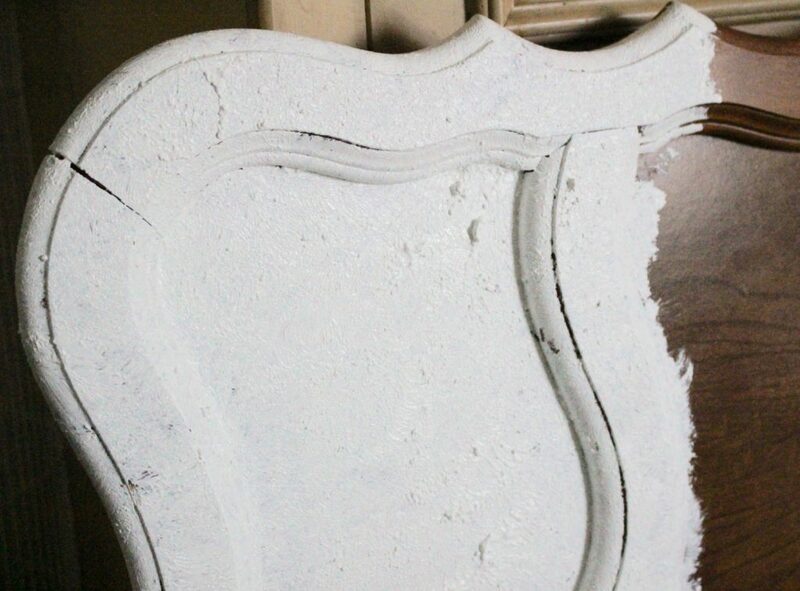 I also added plaster to the detailing at the top of the headboard, which really made it stand out. Next, I sanded it down and then went over it with the aqua paint again. I repeated this process until I was happy with it. I sanded the body of the headboard to reveal the base coat which really showcases the Saltwash finish. 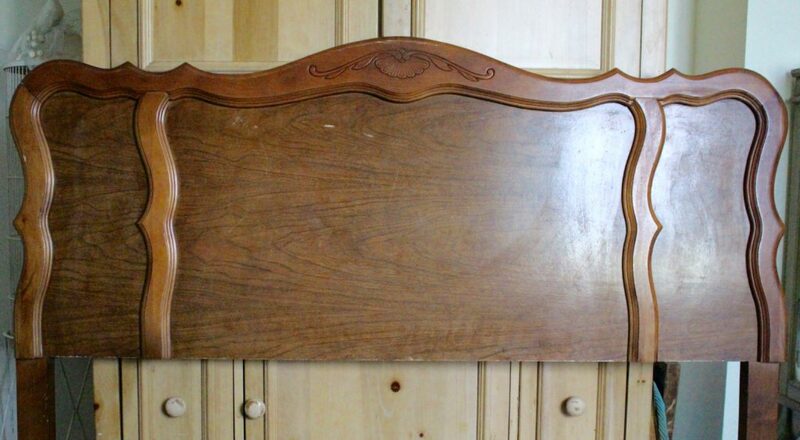 A clear and dark wax completes this unique Coastal Headboard. See all that chippy, aged goodness? That is the effect of Saltwash! Here it is all set up in my daughter’s room! I don’t know who loves it more! To see all of the contest entries for the June Fab Furniture Flippin’ Contest please visit our lovely hosts Carrie at Thirty Eighth Street and Colleen at 58 Water Street You will be amazed at all the talented participants! 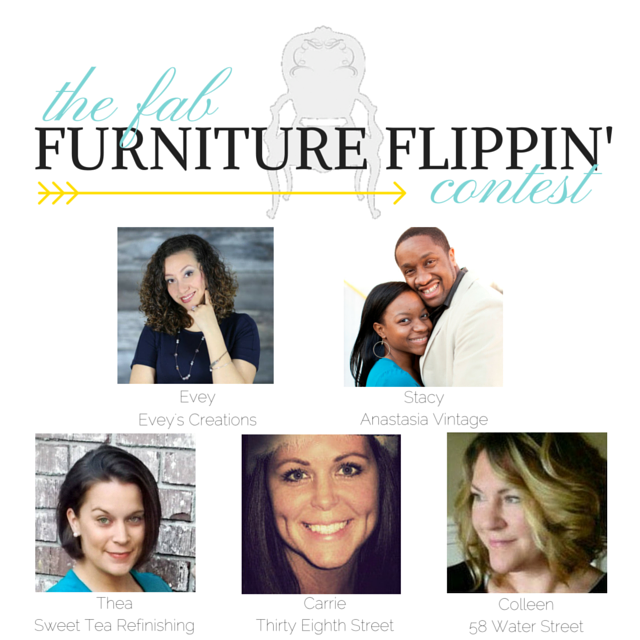 The Fab Furniture Flippin’ Contest is open only to participants who have signed up through the group Facebook page. If you are interested in participating in this contest going forward, please contact Evey at info@eveyscreations.com or Stacy at info@anastasiavintage.com or email the FFFC team at info@fabfurnitureflippincontest.com to find out how! Thank you so much for visiting Our Crafty Mom! The headboard turned out great. I love the addition of the seahorse. Wow! This turned out super cute. You did such a great job! I just love how this turned out. That seahorse is adorable! I love using Sand Wash. I can’t wait to use it again. Great job. Love the colors too. Hi Michelle, I have not heard of this product before, so thanks for sharing with us at Snickerdoodle Sunday! 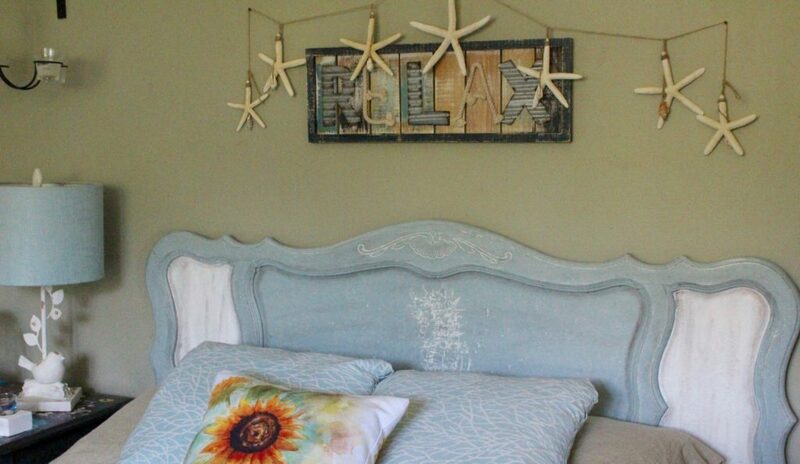 The headboard is so cute especially with the addition of the seahorse! Great job. Pinning to share. How much do I love this headboard?!! And the seahorse puts it over the top! Michelle, I love how this turned out! The color combination and then that sea horse is adorable! This is gorgeous! I’ve never heard of saltwash, but I’m now very intrigued by it. I googled it to see where I can buy it, but there is only one retailer in SC that sells it in a town I’ve never heard of. 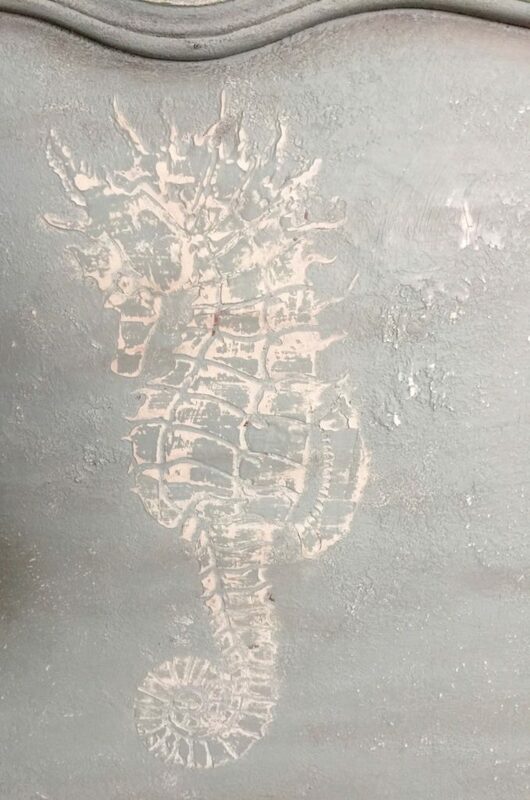 Your stenciling work on the seahorse is fabulous! Very cool Michelle. This is a very interesting effect and I would imagine you can even use it to create artwork. Beautifully done. 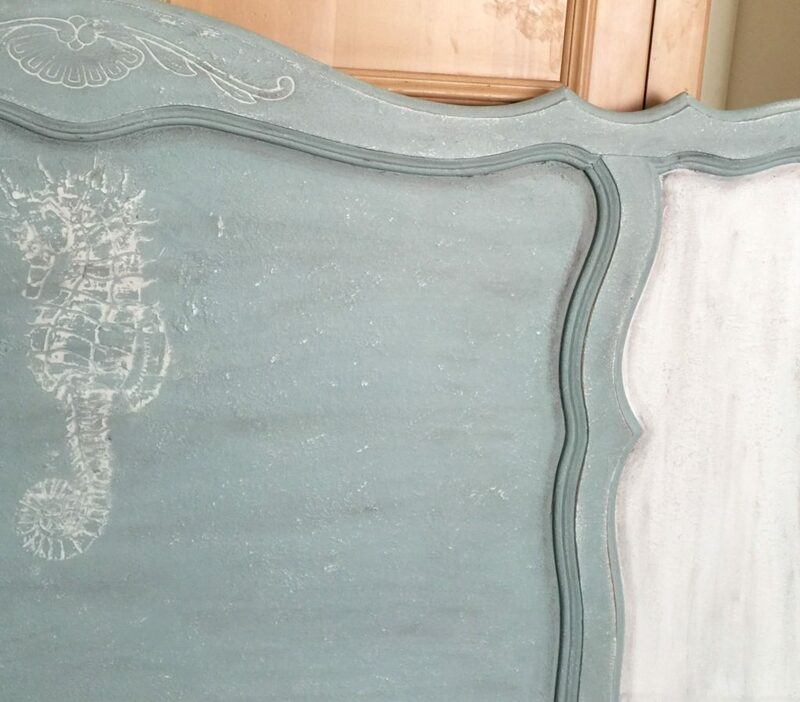 Love your headboard and the colors and the Seahorse! The headboard is so pretty. Wasn’t working with Saltwash so much fun? Love your color choice too! Thanks Sahana It is such a cool product & I will be using it again for sure! That color is like an all new neutral! And that seahorse!!!! Adorable! Nice job girl, as usual. Thanks Sue. This product was so much fun to work with! How cool! 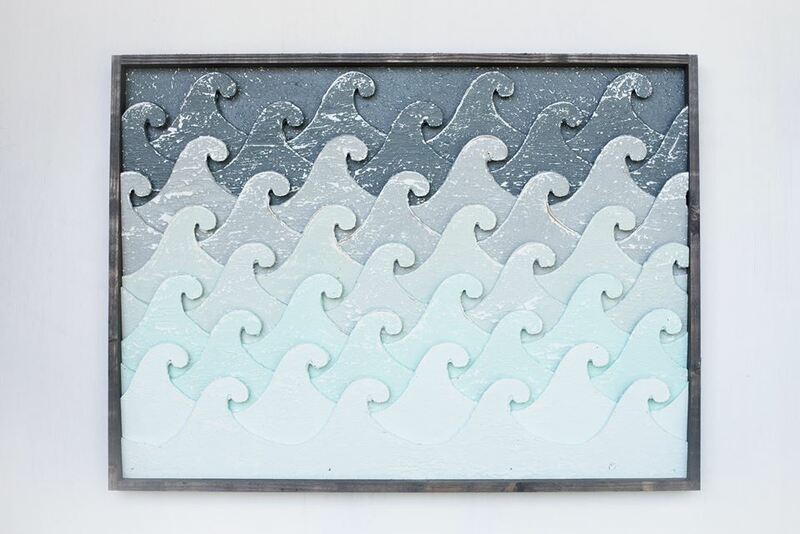 I’ve decided to fill my house with a Hawaiian coastal theme, so this product would be perfect for me. Thanks for sharing your tutorial on Merry Monday. That sounds awesome Erlene! 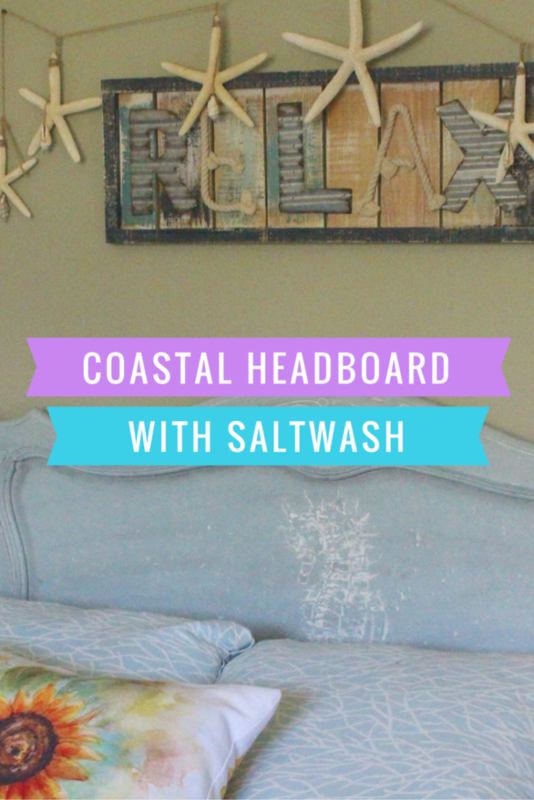 I just love the coastal look & thankfully my daughter does as well! Have a great weekend! Great makeover, love the use of that great stencil with the texture, have to file that in my creative cap. Nice Job! That is a gorgeous makeover. I like how “beachy” it looks. It’s a beautiful color choice too. This is so pretty! It may have been difficult, but I agree with you that it was worth it! Thanks for sharing! Wonderful look on the saltwash headboard. I Have small furniture shop…love using saltwash on many of the pieces I work with it’s a great cover up for nicks and dings.